No one should overlook the benefits of dips. Bar dips deliver excellent upper body mass and strength gains, largely because of the unique mechanics of the movement. If you include bar dips in your routine, be sure to review my tutorial: How to do dips (Note: this tutorial is on triceps dips. 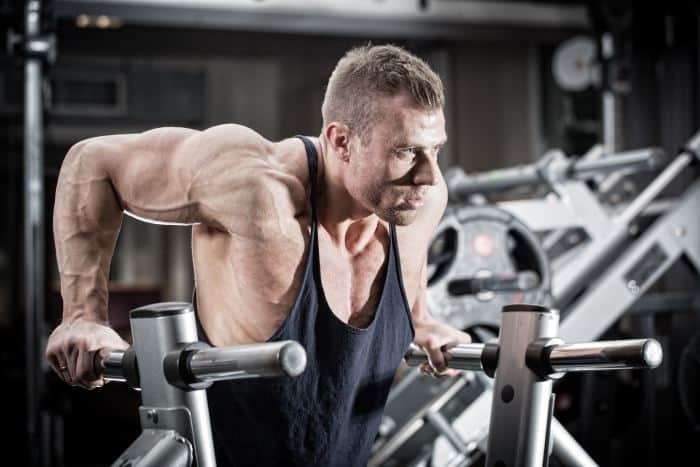 For chest dips, just lean forward – otherwise the technique is the same). It’s a Closed Kinetic Chain (CKC) Exercise. A CKC exercise involves moving your body while your hands (or feet) are in a fixed position. Dips are one of the few upper body CKC exercises. As a CKC exercise, dips simultaneously work opposing muscle groups while lifting andlowering. Related: Pull ups are another great upper body CKC exercise, which emphasizes the back. Add Unlimited Weight. Dips are a challenging exercise by themselves. But you will outgrow bodyweight dips in no time, which brings me to my point: It’s so simple to add weight to your body. I recommend buying a dip belt . Alternatively, you can hold a dumbbell between your legs or wear a backpack with weights in it. Build Upper Body Mass. Since you are able to continually add pounds to your dip strength, you’re able to continually overload your muscles. And if you are progressively overloading your muscles with more weight and eating a sound bodybuilding diet, you are guaranteed to build muscle mass. Superior to Push Ups. The push up is a great bodyweight exercise. And it is the most similar CKC exercise to dips. However, you are able to lift your entire bodyweight with dips (and then some, if you add weight). You only lift a fraction of your bodyweight with push ups. And while it’s possible to do weighted push ups, it’s not always practical. Improve Your Lockout Strength. A dip repetition isn’t complete until your elbows lockout. Sometimes those final few inches are the most difficult part of the range of motion. You improve lockout strength significantly by doing dips. This strength transfers directly to the lockout phase of related exercises like the overhead press and the bench press. Note that the above benefits of dips are still possible if you’re only able to do assisted dips. Great ideas, thanks dude! Orayt!